If you were at the launch of Spacing’s first ever national issue at the NAC this summer you’ll know that Spacing contributor Adam Bentley has created buttons based on his iconic Ottawa Transit Map of the Future — they were selling like hotcakes at the door and suddenly were appearing on shirts and lapels all over the venue. But if you missed the launch, that’s OK – Adam has made them available via Paypal for the low price of only $2.85 each – including tax and shipping. 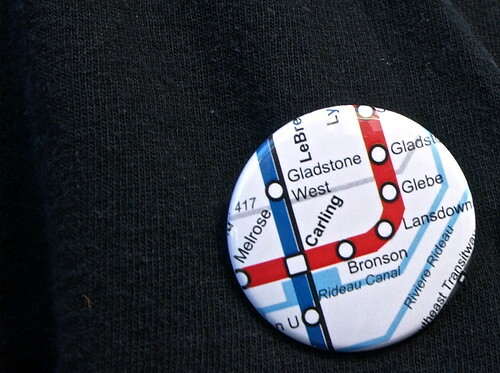 The 1.5 inch buttons come in two versions – Glebe (as seen above) and Lincoln Fields. This entry was posted on 2012: March 25 by adambentley in Urban Planning.